In conjunction with WSCC's Walks and Rides programme, a coastal ride was arranged for today, commencing from Bognor Library. Unfortunately the publicity showed a 1pm start in the WSCC programme, but a 2pm start in The Pedaller and our local runs list. Luckily your dutiful leader was there to meet two visitors from Lewes who had arrived for 1pm , and persuaded them to sample the delights of Bognor Regis until the ride left at the re-arranged time of 2pm. 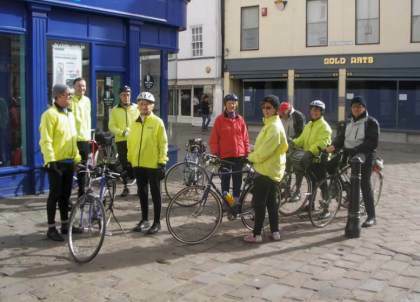 Seven of us eventually set out in deceptively warm weather, only on the return leg was it clear exactly how windy it was! Our route ran via Felpham, Ancton, Elmer, Climping Beach, Climping School, and Rope walk, to Littlehampton. Our guests from Lewes had done most of the south coast run and were interested to find a route westwards from Littlehampton, so for the return I decided to show them a 2nd alternative as we went via Wickbourne, and under the railway to reach the “official”, if isolated, cycle track between Littehampton Tesco and Ford Lane. From there we went via Horsemere Green, Yapton, Bilsham, Middleton and back through the Felpham estates to Bognor. Mileage start to finish was 18.4. Four hardy riders gathered at Walberton Pond with waterproofs at the ready for our Mothers Day ride to West Chiltington: Edwin, Sam, Phil and Mary. Phil decided to avoid Madehurst and instead detoured to the south through Ford and then north again to Arundel and up the long climb from Arundel to Whiteways. We then followed the usual route through Houghton Bridge and Amberley to the bird sanctuary at Wiggonholt. It was not raining when we started, but a light drizzle had set in by the time we arrived at our coffee stop. From Wiggonholt we took the direct route north towards Pulborough and then east to the Five Bells at West Chiltington. The Mothers Day rush had not yet started, but three members of the Horsham section were already into their first round, and we settled at an adjacent table. In due course, Colin arrived having taken the high route over the Kyber Pass with Tom (who had returned from Amberley). Colin joined us for the run back to Houghton Bridge in a steady drizzle, then chose to return over the pass. We pressed on up the hill then down the A29 to Fontwell, and back to Chichester. Sunday 19 March. Ride from Chichester Cross to Coastguards Cafe, South Hayling. Weather today was brilliant blue skies all day but still cold with the usual NW wind originating in the Russian Steppes. The wind strength was down on the last few days and temperatures were up a degree or two reaching a balmy 7C. Numbers were down on those we normally see on a Hayling Island ride with some away and some no doubt put off by the cold. 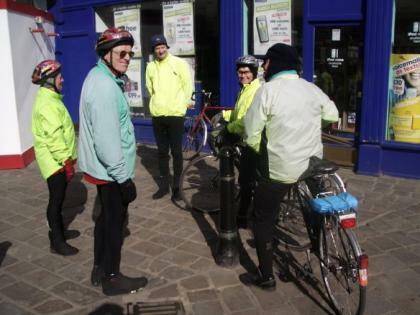 I led the ride and was joined at the Cross by Harvey, Phil and Mary and Alan and Liz. 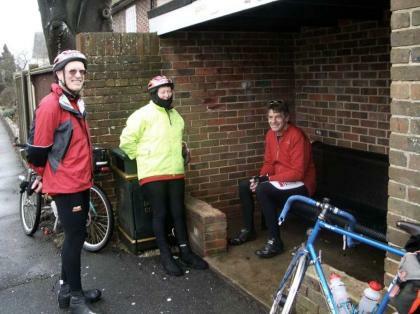 Phil and Mary were having a warm down ride after completing a 200 kilometer (125 mile) Audax ride yesterday. We took the usual Clay Lane route to Westbourne and then down to Emsworth for an elevenses stop at the Greenhouse Cafe where we settled for a table outside in the sun. We continued to Havant and then down the Hayling Billy Cycle track down the west side of Hayling Island. Portsmouth and the Spinnaker Tower showed up well on a very clear day. Nobody was inclined to have sandwiches in the cold wind so we all had a meal in the Coastguards Cafe on the front. The return route took in lanes on the East side of Hayling Island and then across to Hillier’s Garden Centre Cafe near Bosham for tea. Near the Cafe they had a set of Conservatory chairs for sale called the “Edwin Suite” and there were some comments that I ought to buy it. After tea we headed home in different directions. My mileage for the day was 43 and mileage from and back to the Cross was 31. Six of us left Walberton Pond at 9:30 in a light snow flurry: Colin, Jill, Anne, Ernie, Phil & Mary. 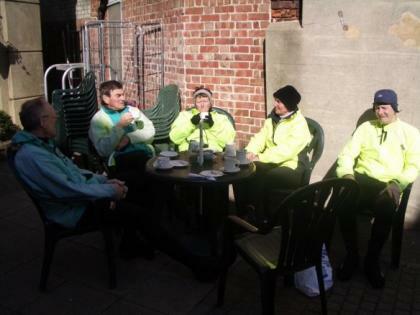 Colin led us up to Whiteways via Madehurst then down Houghton Hill and across to Bury where we stopped for coffee. We arrived at 10:25 am 5 minutes before the scheduled opening time, but were able to enter immediately and place our orders. From Bury we continued west to the bottom of Duncton Hill, then through the school to the A272, a loop through Lodsworth and then south again to eventually arrive on a minor road behind the Royal Oak, our lunchtime destination. 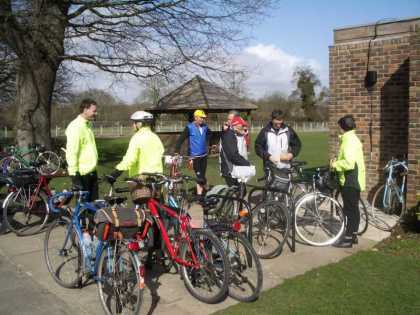 Despite it being about 2 degrees in the garden and the fact that there were about 20 cyclists inside the pub, the landlord took offence at a small group eating sandwiches in the garden. Plans to go inside for a bowl of soup were consequently ditched, and it was a pretty chilled group that climbed back on to their bikes for the return trip. We lost Anne but gained Chris. Colin led us back though Elsted, up Turkey Hill, down to Chilgrove, and then minor roads to West Dean where we stopped for tea (and to warm up again). We continued to East Dean, and crossed Pillegreen Hill, separating at the bottom with Colin, Chris & Ernie heading for Boxgrove, and Jill, Phil & Mary heading back to Chichester. Sunday 26 Feb 2006: Stansted Garden Centre Cafe, Stansted. The weather was mercifully dry after the last two Sunday washouts, but there was a bitter wind. Since the lunch stop was so close to home I set off at 11am and went straight there. I travelled as far as Havant on the A27, turning left in Warblington and then travelling through Southleigh Forest on minor roads, arriving at Stansted House just after 12pm. Luckily I managed to bag an inside table and a section of the Sunday Times in the perpetually crowded cafe, as it was far too cold to eat outside. After the usual pot of tea and piece of cake I departed at around 1pm, arriving home about an hour later. My mileage at the end of the day was 38km. Yet another wet day (I can see why Edwin winters abroad now!). My route was the usual Portsmouth - Havant - Emsworth - Chichester along the A259. Upon reaching Chichester I made a left turn up the Centurian Way cycle route, and followed it as far as Binderton on the A286. The cycle path was very muddy at its northern end, where its surface was compacted earth, as opposed to the tarmac of the rest of the way. Once I left the cycle way I cycled the rest of the way towards West Dean on the A286. all downhill back to Chichester & Portsmouth. My mileage at the end of the day was 71km. The weather was appalling today, with low clouds and heavy rain the entire day. I set off from home at 11am, and passed quickly through Havant & Emsworth, then bombed along the A259, turning right through Apuldram just before reaching Chichester. Upon joining the A286 it was a straightforward run towards Birdham, and then a welcome arrival at the Garden Centre Cafe at around 12.30pm. A large pot of tea and piece of cake were ordered, and then taken whilst sitting on a leather sofa in front of the fire, as I attempted to dry out. After a read of the Sunday papers, which were usefully provided by the cafe, there was no putting off departure any longer, so it was head down into the still pouring rain and head for home asap. My mileage at the end of the day was 68km. Sunday 5th February 2006: Greenhouse Cafe, Emsworth. There was a good turnout for this from the Chichester Cross, with about 10 people in attendance. I set off straight from home just after 11am, and travelled to Emsworth via Havant on the A27/A259. I arrived slightly early, just before 12pm, so waited on one of the benches in the square opposite the cafe. Once everyone arrived we trooped into the cafe, some off us opting to sit at tables outside since the weather was so mild, others at the steamy inside tables. After we had finished our lunches we set off for home, myself west to Portsmouth, the others east towards Chichester & Bognor. My mileage at the end of the day was 30km. Weather today was clear and sunny with light winds. Temperatures reached 21C. I decided on a ride to a beach but riding up a few mountains in-between. I had heard there was a very good beach on the far south coast of the Island near Playa Blanca known as Playa de Papagayo. 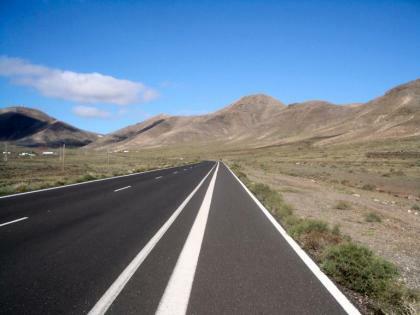 I cycled there on the back road to Puerto Calero and then up to the main road. Just before Uga I turned off on the back road to Femes gradually climbing to 1200ft. Then a sharp descent. Just before Playa Blanca I turned off on an unmade road. This was rough but just about rideable on a road bike and went on for 3 1/2 miles. The beach was as advertised, a beautiful cove enclosed by cliffs. I had lunch at a cafe on a terrace on the cliffs above the beach. After a couple of hours sunbathing on the beach I headed back on the same route. After the steep climb back up to Femes I stopped for an Orange Juice in a restaurant at the top. 36 miles for the day and 2800ft of climbing. Sunday 5 March. Last Lanzarote ride. Weather today was mixed with a lot of cloud but some good sunny intervals. There was a strong northerly wind and temperatures reached 19C. After Teguise at 1000ft I climbed up through Los Valles with a few hairpins and then a gradual climb to the top at 2000ft. Then down the multiple hairpins and loosing 1000ft. Just before Haria I turned off on the Tabayesco road. This is a narrow byroad which winds its way down a valley to the coast road near Arrieta. I then headed south with a welcome tailwind on the main road before turning off for Costa Teguise where I stopped for lunch at a restaurant on the prom. Then the cyclepath on the prom and through Arrecife which had very little traffic on a Sunday and the Prom/cyclepath back to base. 56 miles for the day and 3100ft of climbing.